New York Strip, is one of my all-time favorite cuts of steak. Cooked to a perfect medium rare, the New York Strip has great favor, a tender texture, and is perfect with all the traditional steakhouse side dishes. The quality the meat, as always is super important, and here I’m cooking some of the best from Certified Steak and Seafood. As you’ll see, the marbling is great, which ensures a great flavor and texture, and I loved cooking (and more importantly) eating them. To complement the steaks, I’ll show you an old steak house trick, using a compound butter to add a bit more flavor and decadence. Hope you enjoy them! Season both sides, liberally with salt and pepper – other spices are of course optional, but not these. 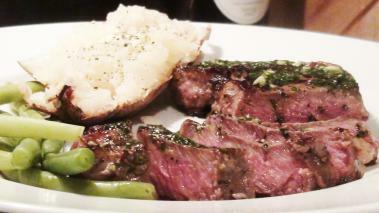 Serve these incredible New York Strips with your favorite sides and enjoy! I love serving Cabernet Sauvignon with these New York Strips. The char on the steaks goes perfectly with the dark fruit, tobacco and leather notes associated with a good cab, and the fat from the steak and butter will also help lighten the tannins in the wine.